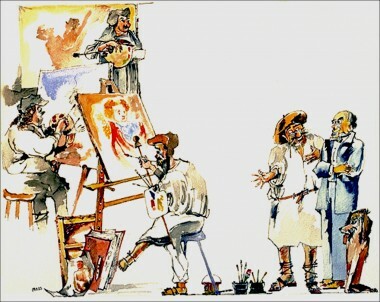 There is an immense void between the pecuniary value of a Rembrandt and the paintings of his colleagues and studio collaborators, first-rate artists the likes of Jan Lievens, Willem Drost, Govaert Flinck, and the legendary Carel Fabritius, even if, because of their high artistic quality the latter’s paintings are often mistaken for works by Rembrandt van Rijn. The rights Rembrandt acquired when he took on apprentices complicates the identification of genuine works by the master. The apprentice’s Articles of Indenture gave Rembrandt the right to sign his students’ paintings with his own signature. The artist was likely to avail of this privilege when his pupil's painting was of a high quality. This created much subsequent confusion; the Rembrandt signature on a painting might be genuine but the painting was, in fact, done by another artist.